I saw a post on Facebook today with a picture of a turtle and the message read, "help a turtle cross the road, but don't try to relocate him or steer him away from the direction he's going. Helping him find a "better place" could endanger his life." I've never seen a turtle cross the road in my life, so I thought "OK" and went on with my day. Not a half hour later, I left to run some errands and guess what I saw? A turtle crossing the road! I pulled my car over and tried to deflect traffic. It was a pretty sleepy road, but I'm standing in the middle of the road, waving my arms and pointing and some dude just aims his car right at the turtle! The turtle's pace quickened and the car's tires ended up straddling him. I screamed and covered my eyes, but the turtle was safe. He made it across the rest of the way without incident. A couple of ladies who had witnessed everything helped the turtle up on the curb and it went on its merry way. I believe everything happens for a reason and I tend to pay attention to intuition, synchronicities and the messages we receive along the way. The more you pay attention to things people call "coincidence", the more of those "coincidences" you see and the less likely it is that they can possibly be coincidences because they happen so frequently. God, Spirit, the Universe—whatever—speaks to us in that way multiple times a day. Sometimes the message is one that is beneficial to you. And sometimes you get the message to benefit another. Today I was given the message to help the little turtle dude. And I spread that message to people driving by and to observers today. There's no telling how many turtles might be saved. But let's not forget about the turtle's role. His job was just to go about his day and trust his instincts....the instincts that told him to cross when and where he did, the instincts that told him to quicken his pace at just the right time and the instincts that told him he'd be ok if he just stayed the course. Spiritually speaking, life is a dance of listening and trust. We live consciously, paying attention to the signposts along the way. We trust our intuition. We trust we're being watched over. And we listen for clues on how to course correct along the way, if needed. If we manage to live within this recipe of ease, like my turtle friend does, then miracles will pop up to ensure the safety of your course. The turtle seemed to know where he was going, but that's not always the case in life. Again, listening and trust are your best allies. If you stay the course, the right pathways will open at the right time. 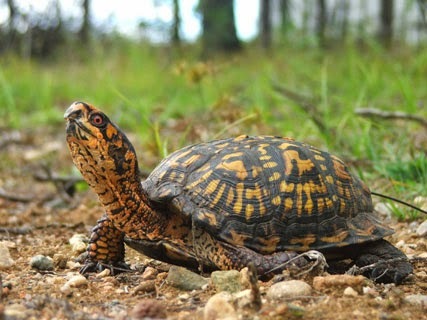 For the curious, I learned a little about the Eastern Box Turtle today, which is the guy pictured above and the same turtle I help across the road today. To give you an idea of size, he was about the size of a half cantaloupe. Apparently turtles commonly live in water and tortoises are land animals. But the Eastern Box Turtle is a land animal. Virginia has no native tortoises. Another turtle thing I didn't realize (I clearly know nothing about turtles) is that they hibernate until early May, then they go out searching for a mate and places to lay their eggs. So it's an active time for them, which is why you'll see more this time of year. Likewise, late summer to fall is also active as they go about readying for hibernation. I got much of this information from the Wildlife Center of Virginia. Just one more quick thing. The picture represents the guy I saw well, but he was so much more magnificent in person. His quick little shuffle when he was about to get run over was the only thing that broke a profound stillness in him. That's what listening and trust does...it quiets the fears and debates in the head and makes the head more accessible to instinct and listening and trust. The more you practice it, the stronger you get! While I've gotten a lot of mileage in my career for helping originate and shape the "Fear The Turtle" campaign for the University of Maryland, today I'm changing my tune. BE the Turtle, my friends, and you will have nothing to fear.